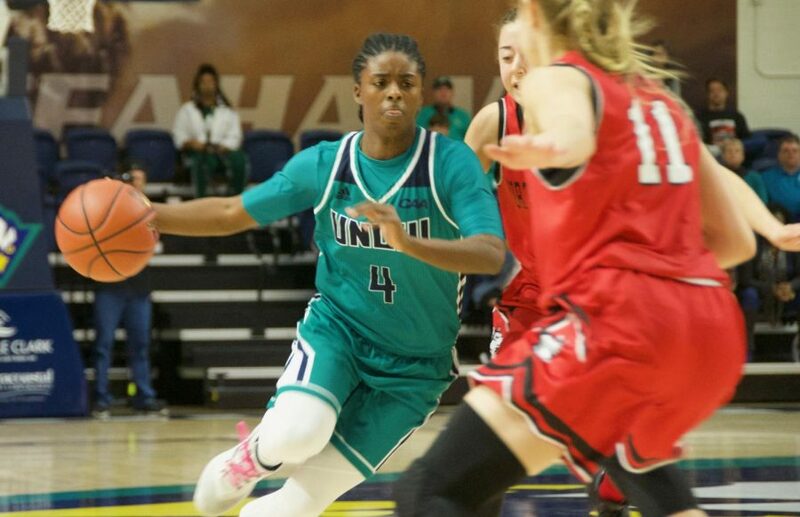 Shrita Parker (4) during UNCW's contest against Northeastern on Feb. 3, 2019. UNC Wilmington continued its four-game homestand with a 83-70 victory over Northeastern on Sunday afternoon. The win, UNCW’s second in a row, improved its perfect home record to 10-0 and is also its fifth win in its last seven games. The result, which came on Alumni Day, marks a continued improvement in head coach Karen Barefoot’s second season in charge. For the second consecutive game, the Seahawks (13-7, 6-3 CAA) had four players in double figures. Guards GiGi Smith and Shrita Parker combined for 39 points — 21 of which were in the second half. Senior center Chinyere Bell barely missed a double-double with 14 points and nine rebounds on 6-of-7 shooting, and junior guard Lacey Suggs stuffed the stat sheet with 15 points, seven rebounds, three assists and three steals. Being that it was a physical game, with many players riddled with floor burns, Barefoot acknowledged postgame that the game itself was far from the smoothest. Barefoot had special praise for Bell, who had a highly-efficient game despite only playing 28 minutes due to foul trouble. The Seahawks, who shot 57 percent from the field, led by as many as 19 points in the fourth quarter after several scoring runs to put the game to bed. Their longest scoring run was a ten-point stint in the third quarter. They also shot 50 percent from three-point range. Junior guard Shannon Todd scored a quiet 18 points to lead the Huskies (14-6, 4-5 CAA), who trailed all game and have now lost five of their last six games. Senior guard Jess Genco and freshman guard Kendall Currence each added 10 points. The Huskies shot 38.6 percent from the floor and 32 percent from deep. Although the Seahawks have been dominant in the Port City comforts of Trask Coliseum, five of its final seven games are away from home. The players acknowledged that while it is nice to win at home, winning anywhere you go is important. Smith mentioned that the home-crowd energy is crucial in helping the team gain confidence, which has led to the team’s success.